When you're working in wet, dry or oily conditions, it can be difficult to grasp objects without your hands slipping. 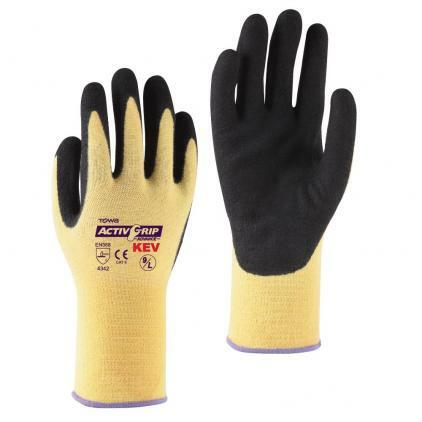 The Towa ActivGrip Advance KEV TOW591 Nitrile-Coated Gloves combine Kevlar fibre with Towa's MicroFinish technolog to provide you with excellent grip and enhanced cut resistance. 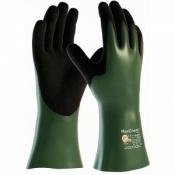 The gloves ensure you're able to remain dexterous while preventing the penetration of oil through the gloves. 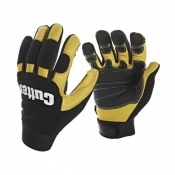 These gloves are black in colour with a yellow Kevlar liner. Their product code is TOW591. The ActivGrip Nitrile-Coated Gloves have been tested to EN 388, which is the European standard that gauges a glove's resistance to a range of physical threats. Please see the table below for a breakdown of the gloves' results. To ensure your gloves fit you as well as possible, the Towa ActivGrip Nitrile-Coated Gloves are available in five different sizes. Please refer to the measurements below to find the gloves that are most suited to your needs. The correct size can then be chosen from the drop down menu at the top of the page.